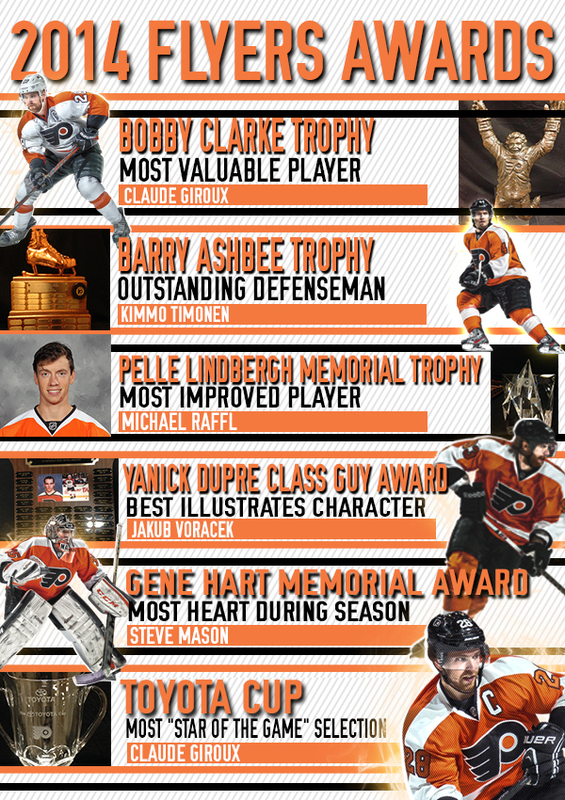 The Philadelphia Flyers presented their 2013-14 end-of-season awards today before the start of their season finale today vs. the Carolina Hurricanes at the Wells Fargo Center. 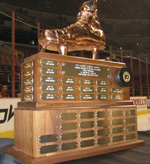 Claude Giroux won his third Bobby Clarke Trophy as the team’s most valuable player, as voted by a panel of sportswriters and sportscasters. Giroux heads into today’s game ranked third in the NHL in scoring with 28 goals and 57 assists for 85 points, and will finish as the Flyers’ leading scorer for the fourth consecutive year. Giroux has appeared in all 81 games to this point, but he posted 78 of his 85 points (all 28 goals and 50 of his assists) over the last 66 games of the season. The Flyers are 21-2-1 this season when Giroux scores a goal and are 33-15-3 when he posts at least one point. 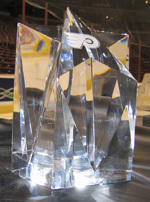 Giroux previously won the award in 2011 and 2012. Kimmo Timonen received the Barry Ashbee Trophy as the team’s outstanding defenseman as voted by a panel of sportswriters and sportscasters. 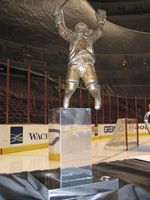 Timonen wins the award for the third consecutive season and fifth time overall, having previously won it in 2008 and 2009. Timonen has recorded five goals and 28 assists for 33 points in 76 games this season while logging an average of 20:20 in ice time per game and a plus-6 rating. Timonen becomes just the second player in Flyers history to earn the award five or more times, joining Eric Desjardins, who won it seven times. 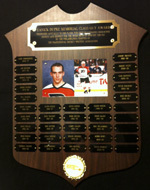 Michael Raffl was selected by his teammates as the Flyers’ most improved player from the previous season. Raffl made his North American professional debut with the Flyers this season after signing as a free agent last May. He spent the previous two seasons with Leksands IF in the HockeyAllsvenskan, which is the second-highest level of professional hockey in Sweden. Raffl smoothly made the two-level jump to the NHL while also quickly becoming accustomed to the narrower rinks in North America. He became a regular in the Flyers lineup at Thanksgiving, having appeared in all but one game since November 25. He has posted nine goals and 13 assists for 22 points to become one of 11 Flyers with 20 or more points this season. The Philadelphia chapter of the Professional Hockey Writers’ Association (PHWA) selected Jakub Voracek as this year’s recipient of the Yanick Dupre Class Guy Memorial Award. This award is presented annually to the Flyer who best illustrates character, dignity and respect for the sport both on and off the ice. Voracek enters today’s game in second place on the team in scoring with 23 goals and 38 assists for 61 points, and is one of seven players who could complete a perfect season of appearing in all 82 games. The award honors the memory of Yanick Dupre, who died on August 16, 1997 at the age of 24 after a 16-month battle with leukemia. Dupre played parts of three seasons with the Flyers (1991-92, 1994-95 and 1995-96), recording two goals and 16 penalty minutes in 35 games. He was originally drafted by the Flyers in the third round (50th overall) of the 1991 NHL Entry Draft. 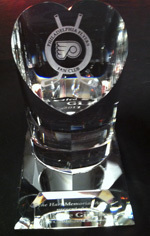 The Philadelphia Flyers Fan Club selected Steve Mason as the winner of the Gene Hart Memorial Award. This award is given to the player who demonstrated the most “Heart” during the season as voted on by members of the Fan Club at their monthly meetings. The award honors the memory of longtime Flyers broadcaster Gene Hart. For 28 years, Hart called the organization’s most thrilling moments, and in the process, helped spawn generations of devoted fans. Hart’s contributions to the sport were recognized with his induction into the Flyers Hall of Fame in 1992 and the Hockey Hall of Fame in 1997. Presenting the award to Mason was Flyers Fan Club president Joe Fisher and Fan Club member Paul Mazzochetti, along with Sarah and Lauren Hart. The Flyers Fan Club will also donate $2,000 to the charity of Mason’s choice. 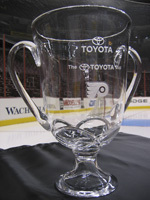 Claude Giroux has won his third consecutive Toyota Cup as the Flyer who accumulated the most points associated with being selected as a “Star of the Game.” Entering tonight’s game, Giroux has been named First Star seven times, Second Star six times and Third Star once for a total of 54 points. Five points were awarded for being selected First Star, three points were awarded for a Second Star performance and one point was awarded for a Third Star selection. Presenting Giroux with the award was Bill Finocchiaro, a representative of the Tri-State Toyota Dealers, who will make a $5,000 donation on Giroux’s behalf to a charity of his choosing.